Could it be that every room in your home is under use and asking any of you kids to give up their room for an office work or business meetings isn’t an option? Take it easy, it may be time to think outside the box now. You may find your garage or at least its section a worthy consideration. What’s more, you don’t have to worry about any permits from municipal authorities. With the right accessory, you can create an office that rivals any in-home workspace out of your garage. 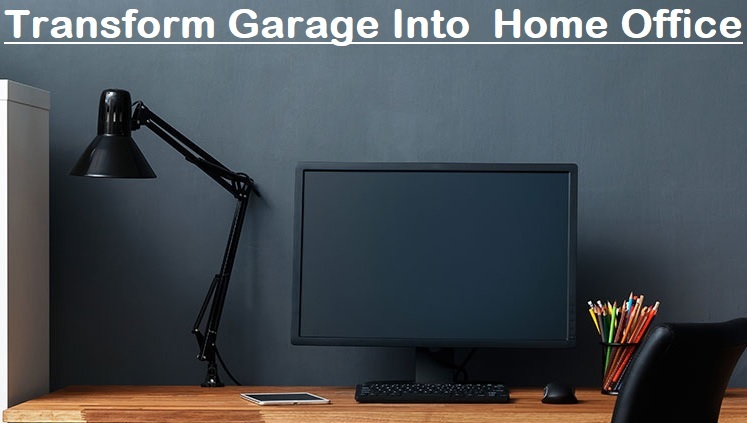 Here is how to transform your garage into your new home office. You need a few tools like table saws and circular saws to make a few modifications. For an easy face-lift, consider investing in hardwood floors paint the walls with a fresh color instead of the old-school concrete floor, overhead lighting and garage doors. This gives it a professional look and more welcoming to clients. Needless to say, you’ll need a worktable, spots for printers and a few cabinets. Consider pieces are multi-functional and easy to be folded up for storage convenience. Having control over factors such as temperature, lighting, and humidity is upright with the right sockets in place. Acquire some humidifiers, fans and overhead lamps to create a conducive atmosphere for working. You may need regular spray for bugs and rodent traps to hinder office hardware damage. As we all know, garages aren’t known for having the best lighting. If your garage resembles the ‘many others’ and lacks windows, your home office may lack much natural light. In lieu of natural light, ensure your new home office is outfitted with lamps wherever you feel you need some extra lighting. With proper lighting, you won’t feel like you’re working in a cave where the only source of lighting in the one immediately next to you. See, you can simply invest in an ergonomic chair, glass chair mat, and desk, however, why not take that chance to design an overly cute home office? An entertaining area with pretty touches such as framed pictures, throw rugs and pillows can really prove handy. Make room for essential office tools by clearing any unwanted clutter. Creating some extra space gives you a personalized feeling while you work in the new home office that you won’t even imagine it used to be a garage. Overreliance on extension cords to power your electronics is like beckoning for a fire in your new office. Undoubtedly, you don’t want that, right? Therefore, installing a dedicated 120V and 240V sockets around the news office and the garage is paramount. Needless to say, you ought to keep pets from disrupting workflow. Simply install a key-less combination lock in a few minutes. Set up a VOIP system for screening out nuisance calls and forward texts to your email inbox. You may need to wire the temperature of your home so that they match those of the garage, driveway and of course the rest of your home. You undoubtedly don’t want your home office to be overly cold in winter or too hot in the summer. Ensure all your connections are ready and secure for business. For instance, ensure your internet router serves the entire home and not just some certain rooms. For new equipment connections like fans, telephones, and computers, look into different organizers to group all the wires together thus ensuring your newly-converted office looks tidy and nice. Create some space where you can inspect files and products easily. Install shelving on the walls of the garage that will be separate from the work area. Consider a filing cabinet for office supplies, papers and other essential items near your work area. This calls for insulation of exterior walls. Depending on your location, winters may be too cold and winters extremely hot- garage intensifies them both. Considering that, some heaters, fans or air conditioners will come in handy. When it’s all said and done, the final decision lies in our hands. From experience, a garage has proved to be a comfy home office and I believe the same can apply to you. Ultimately, everything is in the mind, a little creativity could take you there, thank me later.